Review: Aoi Nagisa is the new transfer student of St. Miatre, one of three all-girl academies on Astraea Hill. She finds herself lost on the first day and runs into Hanazono Shizuma, a beautiful and highly respected senpai among the students. Shizuma kindly offers her help, while Nagisa is stunned by her beauty. This is the beginning of a highly enjoyable and romantic shoujo-ai anime, with many colourful characters adding spice to the story with their adorable antics. Some people say Strawberry Panic is a rip-off of the famous shoujo-ai novel/anime Maria-sama ga Miteru, but still it’s a decent anime for all yuri fans. Review: Kanako-san is a yuri-girl beyond help and finally transfers to a prestigious girls high school as a second year student. Her dearest wish is to befriend the beautiful pure maidens of this school and maybe even meet her fated lover. On her first day she gets to know the beautiful, rich and highly admired first year student Maria. However, her happy student life makes a drastic turn after she discovers Maria is actually a cross-dressing boy; and a sadistic mischievous one to that. He threatens Kanako not to expose his secret, in which case he would expose she is a lesbian and make her life a living hell. However, now that she is under his observation 24/7 and is exposed to the jealous gazes of the other students, there isn’t any difference, is there? Maria Holic is the hilarious story of Kanako’s pitiful student life. Being a big fan of shoujo-ai I can’t help liking this series. The animation and general flow is much similar to Sayonara Zetsubou Sensei. Review: Just when Fumi-chan is about to enter high school, her family returns to her old hometown where they lived years ago. Despite her tall figure she is unexpectedly shy and gets teary eyes a lot. Luckily she gets help from Akira-chan, her old childhood friend. They now both visit different girls academies but still spend a lot time together. 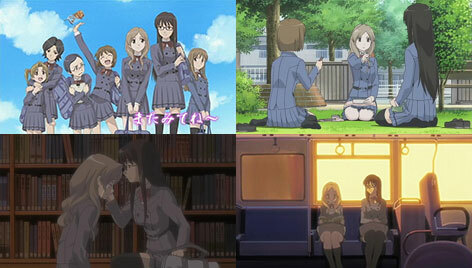 However what will Akira think of her when she finds out Fumi-chan is dating a girl from her new school. 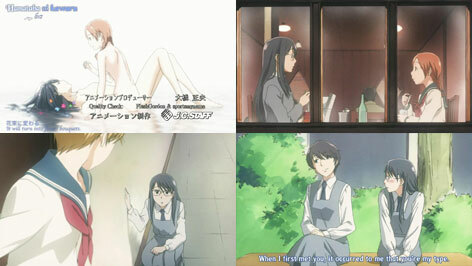 Aoi Hana is your typical Shoujo-ai school anime; a genre much too rare these days. The story focuses more on relationships and love than on comedy. It doesn’t pick up that many clichés, but rather offers a semi-realistic view on the happiness and problems of female homosexual couples in contemporary Japan. Review: Ushio can’t help but openly show her affection for cute girls over and over again. Because of that she lost all her friends and was an outsider during middle school. In high school she befriends the tall, cool and strong material artist Sumika. As she doesn’t fall into the category “cute girl” she isn’t offended by Ushio’s unusual love interest. However, she slowly falls in love with Ushio but fails to be noticed as a love candidate as she isn’t her type. In general as for the quality in art and storytelling the Sasameki Koto anime doesn’t fall behind the shoujo-ai manga it is based on. It’s a nice story; a little farfetched, but not too cliché. Yet this anime probably won’t change the mind of those who aren’t into shoujo-ai, but it’s a nice watch for those who are.